Will Eisner’s The Spirit #16, Aragones, Evanier, Smith. This was a pretty good issue, a light-hearted procedural in a colorful setting. Now, a movie set as a site for actual satire has been done to death, but things are kept light and fun rather than any attempt at social commentary. The Spirit goes undercover and works out the details of a Hitchcockian murder. Nice action, good dialog, even the Spirit himself seems dead on. Nice issue. I guess I’m mostly down on this team for not getting the characterization of the supporting cast pitch-perfect, but this issue shows that they can make the main character and his world work well. Badger Saves The World #5, Baron and Dose. The Badger’s return stumbles dazed across the finish line. Honestly there are more glimmers of Badger goodness in this issue than it deserves, including a two-panel exchange between Daisy and Ham that makes them live. I think Baron had begun to slip back into the characters’ skins. If this were an ongoing series, I’d be seeing signs of life, even after the unfortunate derailing of the artist last issue. Sigh. Apparently the Santa Monica city council is continuing to try to block category C&D jets from using the airport. The FAA remains unamused. I was at SMO today and saw some sizable jets depart. They didn’t have labels indicating their approach speeds, so I can’t be sure that they were illegal in the estimate of the Santa Monica city council. BoingBoing calls my attention to this self-contained airport generator.Â This would be a fine thing to have at one’s beck and call. I had breakfast at the Buckhorn today. For me this requires a flight to New Cuyama airport (L88), and that’s really why I go. New Cuyama isn’t near anything. It’s a small oil and ranching town that’s a place to gather if you’re working in the area or passing through. There’s a gas station, a motel (the Buckhorn) and a recently re-opened cafÃ©. It’s a tiny, friendly town – the smallest nearby that’s easily airplane accessible. That picture on the right is from my “lonely windsock” series. All these images link to larger versions. Inside is a visitors log in which some wag had given his reason for visiting/destination as “hopelessly lost.” I always sign. Boy did I make a crappy landing here today. I went around once and then landed fast in some turbulence (and a nice hot layer of ground effect). It wasn’t very pretty at all. I could tell you a story about how the narrow runway created an optical illusion and all that, but I should probably spend my time hitting a few more small fields. The Buckhorn was pretty busy. It’s a motel as well as a restaurant, and a couple families were checking in as well as a pretty full house of eating customers. 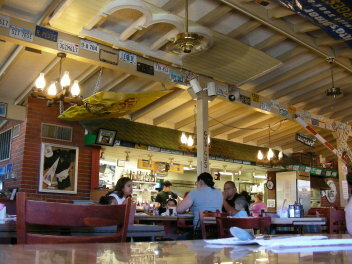 I had a tri-tip sandwich at the counter and soaked up the considerable ambiance. Sadly the advertised “karaoke cook” didn’t seem to be in. I finished up, had another short look around and saddled up to leave. Another pilot was inbound and I gave him a wind report and he let me leave first. The trip home was gorgeous, but uneventful. Yow. (Via Warren Ellis, obviously). 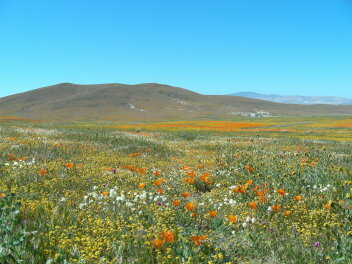 Last weekend Brenda and I packed up and flew out to see the poppy bloom in Lancaster (WJF). There’s lots of other things to do there, so we rented a car and hit some of our favorite spots in the area. The flight was through clear skies, but with some turbulence coming over the ridges. Brenda got to hit her head on the ceiling for the first time and I made a pilot report of the turbulence. First stop was Crazy Otto’s diner, a joint that makes great breakfasts and sandwiches. 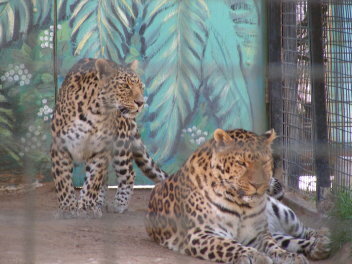 After that, up to the Exotic Feline Breeding Center’s Feline Conservation Center – the cat house in Rosamond, CA. This is a fine set of large cats on display and we enjoy seeing them. 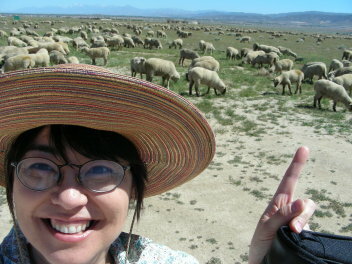 After that it was off to the to see the fireworks, but first Brenda spotted a flock of sheep we needed to check out. The poppies were fantastic, and I’m sure Brenda will show off more of her photography of them. Here’s a quick shot to give you a feel for the range of colors. And here I am looking at them, surrounded by some vibrant orange. After we’d seen and photographed a bunch of poppy vistas, we sort of wandered about deciding when to go home. That was put off when Brenda spotted baseball! 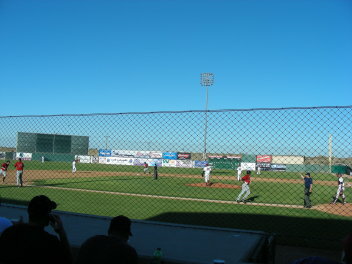 Lancaster has a minor league team (a Class A Red Sox farm club), the Jethawks, who had a game starting essentially right as we passed the stadium. We stopped by and watched a few innings and ate some ballpark food. We left before the game was quite over in order to get up in the air and try to make it to back to SMO before the tower closed at nine. The turbulance had mostly passed, and we did just that. We landed with the controller who issued us taxi instructions and literally closed down the Class D behind us. Grendel: Behold the Devil 6 of 8, Wagner. The last time I did a set of reviews, the watchword was “pacing.”Â Behold the Devil is a nicely paced series.Â The slow burn of the first 5 issues comes to a nice boil here, and Wagner ends the issue with a sharp twist.Â Nicely done, and for the first time I’m anticipating the next issue rather than hanging around for it. Captain America #37, Brubaker, Epting, D’Armata. A new arc begins, the Skull gloats, Sharon squirms, Bucky faces Cap’s old friends and the big reveal from last issue comes into more focus.Â If this were a chess move, it would be something quiet and positional, but sound.Â I’m not gasping with excitement, but everything’s moving well. War Is Hell: The First Flight of the Phantom Eagle #1 & #2, Ennis and Chaykin.Â Though this is in some sense a revamping of Marvel’s Phantom Eagle character, it’s really a story of WWI fighter pilots told by Garth Ennis and illustrated by Howard Chaykin.Â Ennis’s war stories are always excellent with a gritty realism and incongruous grandeur that makes you laugh and pulls your heartstrings.Â Chaykin’s art is precise and intricate with a keen design sense and a wicked sense of humor.Â The combination is delightful.Â And I’m a sucker for WWI flying stories.Â I’d buy it for the pretty drawings of Sopwith Pups and Fokker Albatrosses, but to have a great Ennis story attached is a huge bonus. I’ve got to say, 3 significant figures of accuracy on a 29 year projection is pretty impressive. Or something. For an administration run by a uniter (not a divider), it sure has a penchant for building walls. The Monty Hall problem remains confusing to people (from SlashDot). The Santa Monica city council is trying to regulate jets at SMO, and this perturbs the FAA. 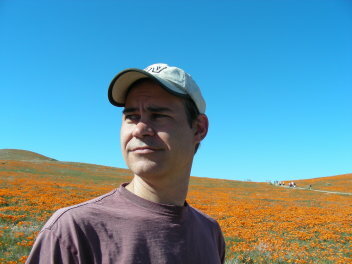 Kevin Lahey points out that Don Brown – my favorite former air traffic controller – is blogging.Â Enjoy. Badger Saves the World #4, Baron and Dose. What happened here? Things went completely off the rails; Caron was apparently not up to the publishing schedule of the book and is gone. The new guy, Dose is kinda thrown in the deep end and doesn’t make it all work. There are parts of this issue where I’m not even sure what’s going on – and not in a good way. If you’re not a Badger competist I’d stay away. The Last Defenders #2 (of 6), Casey, Giffen, Muniz. I want to like this, and it’s not happening. A third of the way in, I haven’t found any character whose fate interests me or who I can identify with or pull for. I’ve been kind of enjoying the Flaming Skull’s ongoing wise cracking, but that doesn’t a book make. I’ll probably drop this. Will Eisner’s The Spirit #15, Argones, Evanier, Smith. Man, I’m still not loving the new team. The art is really nice. if anything it’s maybe a tad too imitative of Eisner, but I can’t really argue with clean lines and good storytelling. The real problem I have with this issue is that I feel like P’Gell isn’t handled quite right. My image of her is of someone a little more on top of The Spirit. It’s rare that the Spirit ever gets the best of her, and then she seems to pop back to the surface like a cork. Her being the half-assed mastermind of this convoluted diamond smuggling plan just didn’t work for me. Your mileage may vary, and the art’s very good. Uncle Sam and the Freedom Fighters #7 (of 8), Palmiotti, Gray, Arlem. The pacing of this book is staring to drive me to distraction. I expect that the creative team had some ideas running around from their previous series that they wanted to resolve, but they really seem to have paced things badly. The first few issues were nice set-ups – and even thoughtful and interesting in places – but now everything’s just happening at once because there’s only one issue left. This doesn’t give a feeling of climax to the final issue, and the whole series seems rattly and disjointed. Missed opportunity. Captain America #36, Brubaker, Guice, Perkins, D’Armata. This, on the other hand, is a pretty good example of pacing. The Skull’s plan bubbles along, new revelations are made, old characters part ways, and the tension keeps a general upward trend. It’s telling that the ending of 35 left a lot of balls in the air, but one clear question :”how’s Bucky going to do against Sin and the Serpent Squad.” This issue ends on a similar cliffhanger. But, along the way, we continue the theme of exploring the differences between Bucky and Steve in the Captain America suit, which is really an exploration of who Captain America is. And with CA being the Marvel ideal of an American hero, this is ultimately an exploration of what a hero is. And there are fight scenes! It’s a great book. If you read superheroes at all, you should be reading this. All-Star Superman #10, Morrison & Quitely. Morrison and Quitely’s illumination of Superman is thick with in-joke nods, but rich with heart. It’s also as good as anything out there in super-hero land. This issue continues to develop the “Superman is dying” plot that has driven much of the series (updating a classic “Last Will and Testament of Superman” story, of course), and showing us what Morrison and Quitely think is most important about Superman. It’s a slow, nuanced issue that still manages to build tension. Young Liars #2, David Lapham. I didn’t like this issue much. I know it’s supposed to be kinetic and loud as a great punk song, but it just felt rushed and forced to me. I usually like Lapham, so maybe I was expecting too much. Doktor Sleepless #6. Ellis & Rodriguez. Clearly bookending the first arc, this issue was a little too much fact and not enough plot and characterization for me. After the last couple issues where the characters seemed to breathe and move of their own accord so much, this felt very expository. There’s even a character summarizing the plot in bulleted lists, which is as clumsy as it sounds. Hopefully this is just a pause as the next arc kicks in the afterburners again. Anna Mercury #1. Ellis & Percio. I’ve been picking up a lot of new first issues lately, it seems, and by and large they’re OK. Most draw me in enough to read another issue and see how things pick up. A few don’t hold me at all. A first issue is a really difficult thing to do right; even some of the most influential series around have mediocre first issues. In Anna Mercury #1, Ellis and Percio show us how it’s supposed to be done. We’re dumped into the action taking place in an interesting world that’s shown to us in glimpses germane to the headlong action that the mysterious protagonist drags us excitedly into. There are enough familiar action/sci-fi tropes to lean on that we can barely keep our bearings even as we see where our protagonist violates those tropes. The issue winds to a cliffhanger that will draw us back for the next issue: How’s she getting out of this? And then the last page pulls 20 G’s zooming us up 30,000 ear-popping, mind-bending feet to where a hundred new questions scream at us while Anna’s still hanging from that cliff below. If you can read this and not need to buy the next issue, you may want to stop buying comics altogether. You are currently browsing the Walking on the Moon weblog archives for April, 2008.